Johannesburg – South African motorists will receive a 24 cents a litre decrease in the price of petrol as of as of April 5. “This decrease could have been much more significant had fuel taxes not increased at the same time,” says the Automobile Association. 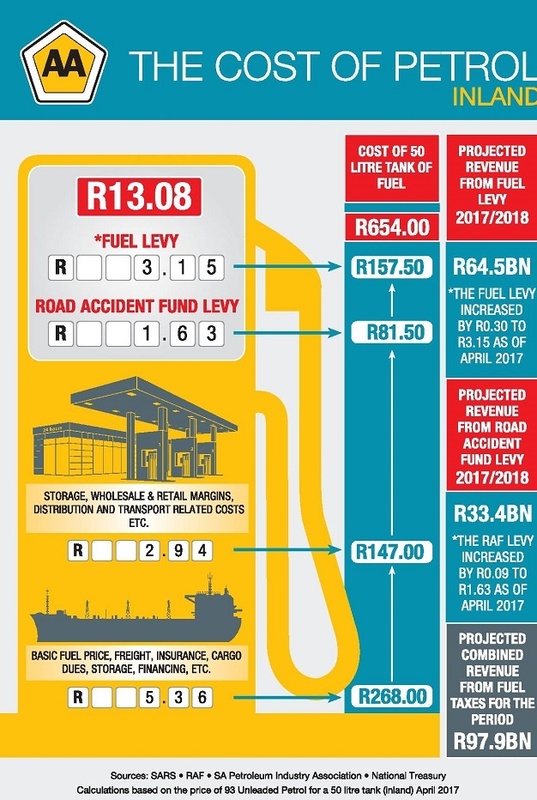 In his budget speech in February, former Finance Minister Pravin Gordhan announced that the the General Fuel Levy would increase by 30 cents, and the Road Accident Fund (RAF) levy by nine cents. What does this mean for motorists? The AA gives us a breakdown of the fuel price. We’ve included infographics at the end of this article. The General Fuel Levy is a tax charged for every litre of petrol sold. In April last year, this tax increased by 30 cents from R2.55 to R2,85. For the second year in a row, this tax is increasing, again by another 30 cents, and will now stand at R3.15. “This money is administered by the National Treasury, and is treated as a general tax and not, as many people assume, for road-related expenses,” says the AA. If a litre of petrol (inland) costs R13.08, then R4.78, or 35%, of the total cost of that litre goes towards direct or indirect taxes, says the AA. The Basic Fuel Price (BFP) is calculated based on costs associated with shipping petroleum products to South Africa from the Mediterrean area, Arab Gulf, and Singapore. These costs include insurance, storage, and wharfage, the cost to harbour facilities when off-loading petroleum products into storage facilities. The current BFP is R5.36. Other costs associated with the petrol price include transport costs (from the harbour to inland areas), customs and excise duties, retail margins paid to fuel station owners, and secondary storage costs. These costs currently total R2.94 for inland petrol, and R2.55 for coastal petrol. Using this data, filling a 50 litre tank with 93 unleaded petrol inland will cost R654. 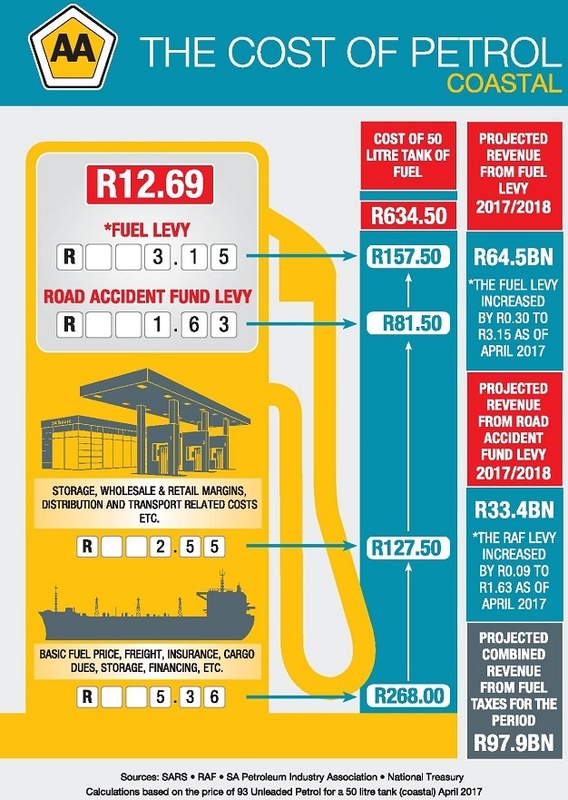 This is comprised of the Fuel Levy – R3.15 x 50 l (R157.50), RAF levy – R1.63 x 50 l (R81.50), associated costs – R2.94 x 50 l (R147), and the Basic Fuel Price – R5.36 x 50 l (R268). “Depending on whether the BFP increases or decreases during April going into May, a calculation that still needs to be done, the price of a litre of petrol could either increase or decrease. However, given the current depreciated value of the Rand against the US Dollar, it is more than likely that the price of a litre of petrol will increase, in the short term at least. “The Automobile Association (AA) releases a prediction for the change in the fuel price in the middle of every month, and again at the end of the month, ahead of the official announcement by government,” says AA.